When I go shopping at markets, I often get carried away when I see a good deal that just cries for my attention. Take for example the $1 or $2 bags of fruits and veggies that are constantly being heralded by stalls wanting to be rid of them. There’s never anything wrong with these bags of produce apart from being a day or two old and not looking as fresh anymore. However, customers tend to ignore these slightly battered looking fruits or veggies and go for the prettier ones on display. I always snag these bags. Which also explains why we always have a little too much food in the kitchen, pantry and fridge. This usually means I have a home prepared meal and save on lunch money during the week. However, there are times when I bite off more than I can chew. Take for example avocados. These tiny buggers are so bloody expensive at the local supermarkets ($2.98 each!) that as much as I love them, I tend to skip out on them due to the price. So when I saw them going 5 for $2, I was caught, hook, line and sinker. 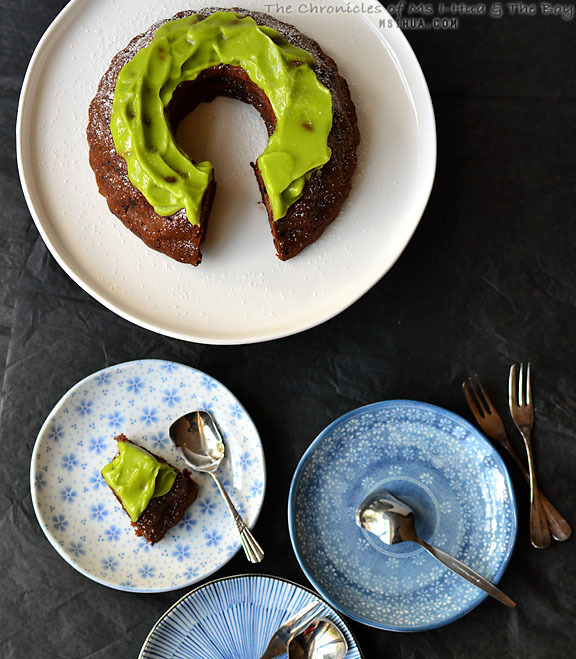 Taste wise, this Avocado Chocolate Cake has no definable avocado flavour apart from a slight hint in the frosting. The cake is super moist and it wasn’t until I pointed out that I had used avocado in the ingredients that people went, “Ahhh! I knew it!”. Preheat oven to 180 degrees Celsius (160 degrees if fan forced). 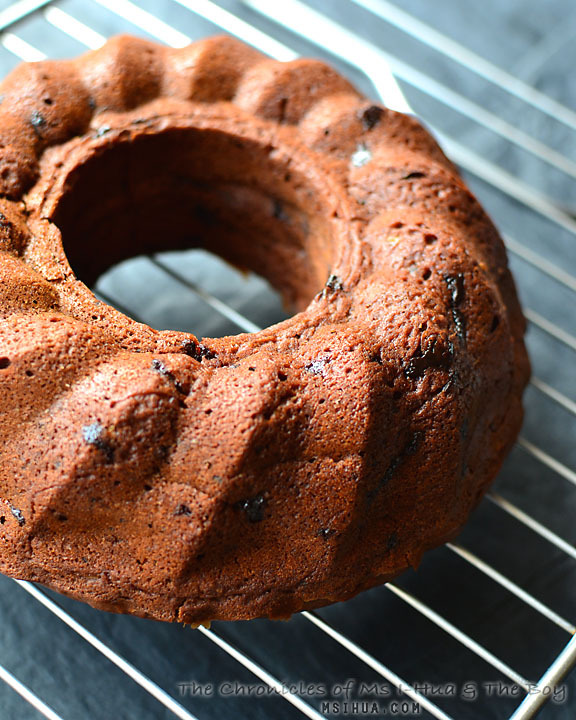 Grease a bundt cake pan and set aside. In a large bowl, place all the wet ingredients including the mashed avocado and mix well. Add the sugar and combine throughly. In a separate bowl, sift all the remaining dry ingredients (except the chocolate chips) together. Add the dry ingredients into the wet avocado mixture and whisk by hand, making sure that it is thoroughly mixed through. Add the chocolate chips and stir through. Pour the batter into the prepared bundt cake pan and bake for about 45-50 mins (or until skewer/toothpick comes out clean). Once cooked, remove from oven and let cool in the pan for another 15 minutes before cooling on a cake rack. Scoop the avocado flesh into a bowl and add the lemon juice. Beat together by hand (or use an electric whisk) to mix the ingredients. Slowly add in the powdered sugar. The colour of the frosting should lighten and change. Once the cake has cooled, remove from rack and place on a cake stand (or whatever you plan to serve on). Spread the avocado frosting on the top of the cake. Serve to your guests. As a surprise, let them guess what the secret ingredient is, you'll be surprise to hear how many vegetables and fruits are proffered that aren't avocado. Use only very ripe avocados and avoid brown spots in the flesh. I liked that the cake was super moist and had a healthy core ingredient. It sure made me feel less guilty as I indulged in a rather large slice of chocolate cake. So what do you think? Would you give this cake a go? Go to the Asian Markets babe.. they usually are cheaper there! Even though it’s chocolate, I’d try a slice. And then ask you politely to make a salted caramel or pistachio version. And you would, because you love me. What a brilliant idea Angle Babe! I’ve never had avocado in a cake before but am very intrigued by it. Simple enough, i may just have to try baking it myself! OMG Yes, yes I would. 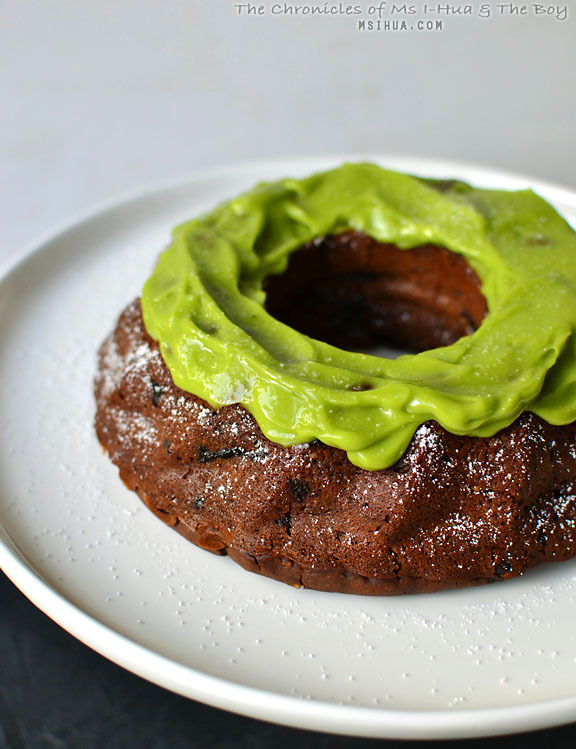 I definitely want to make this because there avocados are plentiful this season and I’m looking for some cakes which are tasty but also provide nutritional value. Haha well aren’t you lucky! All the best! 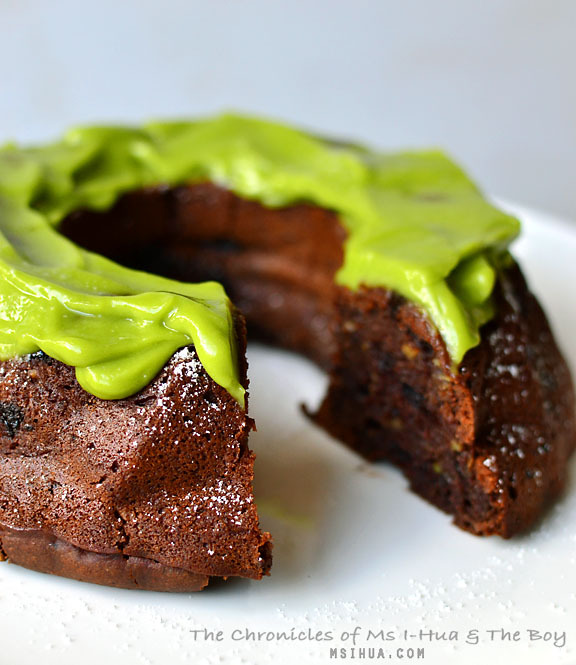 What a great idea – I bet the avos made it super moist. I am a huge avocado fan so I think I would love this cake! It was soooo moist.. almost like using just yoghurt!